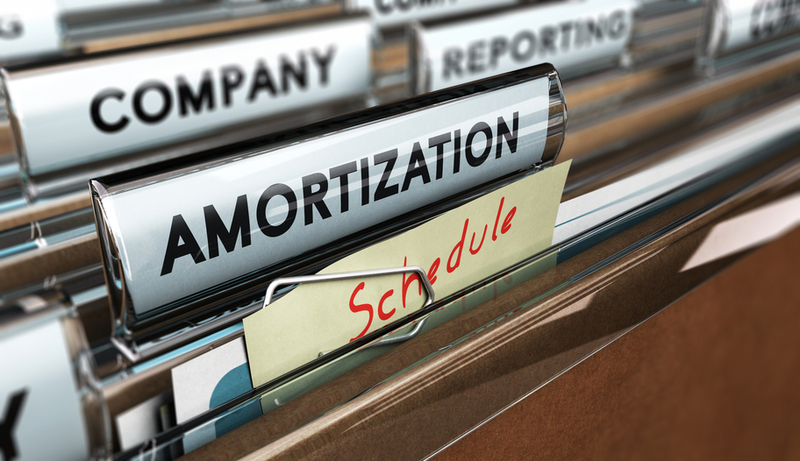 Amortization is a simply a verbose way of referring to the process of a loan's decrease over its lifetime. In the context of real estate mortgages, amortization (literally from the Greek “to die off or die down”) means the graduated lowering of the principal payment of the amount owed as the borrower makes principal and interest (P & I) payments, thereby reducing or “killing off” the total sum of the loan. When your loan goes through the process of amortization, it affects both the principal and the interest aspects of the borrowed figure as each month the total drops closer towards the end goal of zero when the loan is considered terminated. In this calculator, you will plug in the figures relevant to your loan scenario, including total owed, APR, term, taxes and insurance, and receive a number representing your monthly expected payment. This grand total figure itself will be divided up into two sums: the lesser one is your taxes and insurance, while the larger one is the principal and interest on its own. For the sake of accounting and budgeting, you will want to consider the total of these two numbers as the amount of your income that you will actually be slicing out for your mortgage payment every month. Take, for example, a twenty year mortgage term wherein the borrower was taking out $60,000 from the lender. At an annual interest rate of 5.5% and an annual real estate tax bracket of 4.5%, with two related private mortgage and homeowner's insurance payments at $20 and $25 per month, respectively, the total monthly payment due the consumer would be $458.11. Principal and interest alone makes up the vast majority – $412.73 – of this number, while the remaining taxes and insurance add on an additional $45.38 to the monthly bill. Ideally, this figure of $458.11 will not exceed more than 28% of your regular income, or else you may be a candidate for a refinanced loan with smaller payments over a longer period of time. You may then choose to create an amortization schedule for your particular financial situation so as to get a clearer picture of how your principal due falls over time. The schedule shows how the ratio of principal to interest decreases throughout the life of the loan. While the borrower initially pays far more interest than principal, as time goes on the payments shift to being principal-heavy with very little interest. In our example case, the first payment would be split into $275.00 of interest and $137.73 of principal. By the end of the mortgage term in the year 2033, by contrast, the interest payment would be only $1.89 and the principal would be a whopping $411.87. This printable amortization schedule will help you to get a month by month calendar of exactly how much of your monthly income will be devoted to paying off your mortgage. Each row brings you an up to date balance of precisely how much you have remaining on your bill in order to come even with your lender. It will aid in your decision making process whether it is regarding the initial purchase of the house itself, your loan search, or your household budgeting picture.